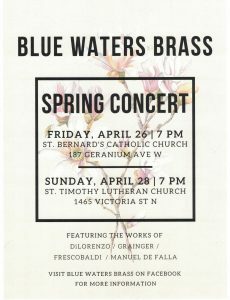 We just wrapped up a great spring concert series this past weekend at St. Timothy Lutheran and the Church of St. Bernard, both in St. Paul! Check out the recording from St. Bernard’s below — St. Tim’s coming soon. Program is here. We had a great time performing our holiday program at St. Timothy Lutheran last night! Here’s the recording as well as the program. Hello all! Now that we are in the middle of winter, let’s rekindle that holiday spirit that kept us warm in December. The Blue Waters Brass and Blue Waters Choir winter concert recording from Dec 10th is now uploaded for you to take a listen. Enjoy! (If you only have time for one, check out the last track, Night of Silence, a very moving arrangement for brass and choir by our very own Eric Sayre). Here’s the program: BWB Program 2016-12-10. We are happy to share that we have recently been recognized as a 501(c)(3) non-profit organization! We would love your support as we continue to grow and bring quality music to our community. Donations will help cover music purchases, performance costs, and other operating expenses. They help us focus on what matters most—making music! Visit About BWB for more information. We had a wonderful time participating in the February 28 services at Mt. Olive Lutheran Church in Minneapolis and hope to return soon! Here are a few pieces from the second service. Just finished the recording from our wonderful December 12th concert with the St. Timothy Lutheran Choir (program). Enjoy! Just added audio from our last two performances plus a few sets from 2013 (more to follow). Check out the recordings category!